If you have ever bought the Primigi Andes for your little girls, I think that you would agree with me that this is one great shoe for new walkers. The sole has just the right amount of flexibiliity and the carefully-designed arch support seems to give wobbly walkers just the right amount of stability and sure-footedness. The patent leather wears beautifully and is very easy to keep clean. This shoe comes in a zillion colors and has been one of Primigi's best sellers for years. It also traditionally comes with a price tag anywhere from $55-$65. Enter Amazon, once again, saving the day for tiny feet needing a little Italian design. The three colors above (viola , fuxia and corallo ) are currently available on Amazon for around $28 (roughly 55% off), with free shipping and free returns. Unfortunately, this low price is only available to the smallest walking customers, sizes 20-22 (4-5.5) for the purple and pink and 20-21 (4-5) for the dark coral. Please note that for the corallo there two size 20 and two size 21 in the pull-down menu; just play around until you find which of the two corresponds to the inexpensive corallo ($27.50). 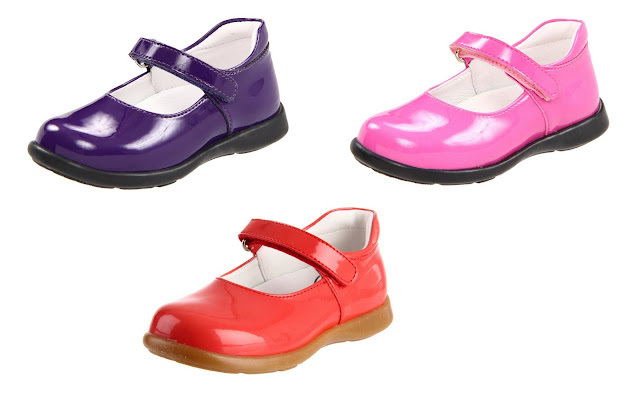 Lovely little patent leather shoes for fall in colors to match her vibrant personality. You red my mind with todays review. I am desperately searching for a pair in red, but big girl size 34. The cheapest I have found was $54. I feel your pain! I just performed a similar search for one of my kids and ended up buying something full-price (ouch). I will definitely let you know if I come across something in at 34 that is cheaper!